This is an amazing piece of art! Great post over at ofifteen. wow, this looks amazing! love how the mugs on the table have a similar style too. really nice. i'm curious how they are hung. i don't see any hooks or brackets or anything. i think that is why i like the look of this--and how they are overlapping! Love plates on the wall and esp. when they are grouped like this.... very cool! wow, super creative. i love finding different china plates, every single one in my cupboard is different, none match. even china cups and saucers. i'm curious too how they would hang, i'd love to steal the idea as i pick up more and more plates! 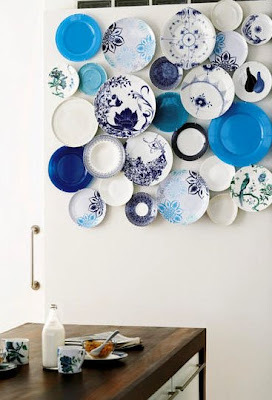 hmmm...maybe i'll further investigate how to hang plates like this on the wall and report back! Oh that looks so neat - wonder how hard it was to hang them?! Great posting! Love the plates! Wow ... that is a great wall.